If you had a chance to watch any of the World Dance Day video, you saw that in addition to showing live ballet classes and rehearsals, they also showed what the dancers do to stay in shape outside of the studio. At Ballet Strength, we love that they chose to reveal dancers behind the scenes in the gym strength training. My favorite clip they showed was of National Ballet of Canada dancer, Chelsy Meiss. Pictured below is Chelsy performing an exercise called the “deadlift” from the World Dance Day broadcast. Today I am going to share with you how to do this exercise correctly so that you can maximize your Ballet Strength just like Chelsy! 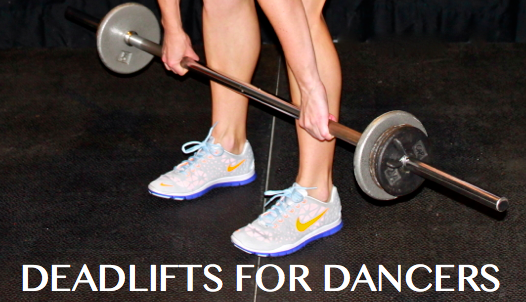 At Ballet Strength all of our programs and DVD workouts incorporate Romanian deadlifts. Romanian deadlifts are a great way to strengthen your hamstrings and spinal erectors, the long muscles that run up and down the sides of your lower back. Our goal in using this exercise during cross training is to strengthen the core and glute/ham tie in to help take the brunt of the stress from dancing off of the ankles – helping to stay injury free. Strength and power in the upper legs will also help with jumps, balance, and turns. Posted on October 3, 2014, in Ballet, Ballet News, Ballet Strength, Dance, fitness, Injury Prevention, Strength Training for Dancers, Technique Tips and tagged ballet cross training, ballet help, ballet legs, ballet strength, ballet training program, ballet workout, chelsy meiss, cross training for dancers, deadlifts for dancers, leg exercises for dancers, Strength Training for Dancers, world dance day. Bookmark the permalink. Leave a comment.